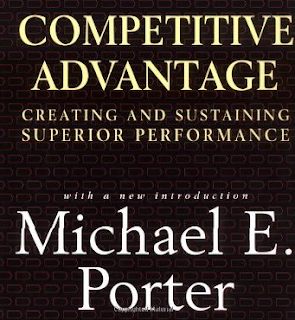 22 Michaels: What is your competitive advantage? 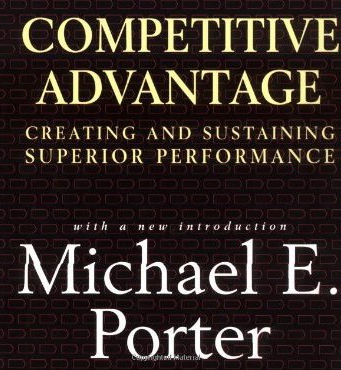 Harvard Business School professor Michael E Porter says that competitive advantage ‘arises from discovering and implementing ways of competing that are unique and distinctive from those of rivals, and that can be sustained over time’. This is also tied closely to barriers to entry. 'Ways of competing that are unique and disctinctive ... that can be sustained over time' will make it harder for new entrants to compete in your market. 1. Facebook - they own the social graph, and all your friends are on Facebook. I might prefer the features that a new social network offers, but if it doesn't know who my friends are and none of my friends are on it there's no point in me switching. 2. Google - habit and your default search engine. When they launched in the late 90's and for a long time afterwards Google's competitive advantage was their search algorithms, they provided much better search results. However they've not been able to completely sustain this into the present time. Microsoft have invested hundreds of million of dollars in Bing and they've arguably closed that gap, but people don't just switch their search engine. We're all used to 'Googling it'. If we need to find something we visit www.google.com, or we use the default search engine on our Android or iPhone which is Google, or in Firefox or Chrome, Google. Google develop and give away the Android operating system and Chrome web browser just so they can be the default search engine without having to pay a fixed fee or a percentage of their search engine ad revenue to Apple or Firefox. Being your default search engine is now Google's competitive advantage. 3. eBay - They've built a network of buyers and sellers. For a competitor to enter the market they need to build up that same network of buyers and sellers. Too many buyer and no sellers won't work, neither will too many sellers and not enough buyers. Building this network is hard to do. 4. Apple - I find this one harder to define but I suspect it's 2 things. 1. Their internal systems and processes that allow them to create, develop and manufacture amazing products that completely disrupt markets like the iPod, iPhone and iTunes, or create new ones like the iPad. 2. Brand loyalty that has developed as a result of competitive advantage 1. What is our competitive advantage at Shoes of Prey? 1. Our website and online shoe designer. While this is different to what is available in the shoe retail market and took some time to develop and build it's not hard for another company to build an online shoe designer like ours so this isn't our competitive advantage. 2. Manufacturing custom shoes. This is difficult to do and from our research there aren't many shoe suppliers in the world who will entertain making custom shoes. We work with two of the best suppliers in the market. That said we outsource this part of our business, there are other custom shoe manufacturers in the market and the investment for a company to build their own custom shoe manufacturing operation wouldn't be that significant nor would it be difficult for a company with experience in manufacturing, particularly shoe manufacturing. A company like this might then struggle with the online marketing this business requires, but again that skill can be purchased. So manufacturing isn't really a competitive advantage for us. 3. Our customer base and our relationship with our customers. I think this is where our competitive advantage and potential barriers to entry lie. We've had millions of visits to our site since our launch so we have reasonable brand awareness but best of all our customers are passionate. They love our product from the experience of designing their shoes online, our customer service and the end product, the shoes themselves. They're passionate about our product and passionate about our brand. A brief read of the interactions on our Facebook page give an idea of this. So I think our competitive advantage and main barrier to entry lies in our customers. The thing that would be most difficult for a competitor to replicate would be our customer base and our relationship with those customers. That's the key area we need to continue to focus on, improve and develop the most. What's the competitive advantage of the business you work in? Interesting post as always Michael, although I'd probably suggest that brand loyalty/customer base isn't usually a strong source of competitive advantage because it's difficult to sustain ie customers can move very quickly. I think examples would be how fast Facebook overtook myspace or Google overtook earlier popular search engines. In the case of Shoes of Prey, I'd have thought the shoe designer would be an important area where a competitive advantage could be developed/maintained. If your designer is years ahead of anyone else's in terms of development, its very hard to replicate or compete with as customers will naturally prefer a better designer. I'd like to suggest that maybe honesty and transparency in what you do may be a contributor to your particular competitive advantage? Excellent customer service is replicable, but the identity of a business is often disguised by marketing and can often have a significant bearing upon individual’s perception about who they are choosing to do business with or buy from. This post I found very thought provoking in this regard, simple vs. simplistic. i agree with Anon above. Customers can be acquired, bought, won, lost or transferred. Loyal customers could be considered a competitive advantage but really are a by product of competitive advantage. I will explain how this can be developed into a competitive advantage. I think your competitive advantage lies in several factors that you have pointed out - the fact that you make custom shoes, the shoe designer & website, the skillsets you have and the brand. However, I think the key is the customer data that is built over time. Making any product, particularly custom shoes is very hard to get that fit right. I would assume repeat purchases from the same customer means that the measurement and fit is correct. The sizing will only get better as you get more feedback from the customer and the overall customer base. Making custom shoes on a mass scale in an efficient manner, I would think is no easy feat. Agree with the above, with lost of money, not hard to hire marketers, customer service teams and buyers who can replicate what you've been offering. Actually I still think the risk is that someone collects massive funds, to not only offer the same service but also invest in massive advertising campaign to build awareness and brand equity quicker. - agree you should build your barrier by continuously being the closest to your customers' needs i.e. 2) remember each customer's specificity and building a database like no one can. Anonymous - our online shoe designer definitely makes it a little harder for others to enter the market, but to be honest, a couple of hundred grand and looking at ours for ideas and it's not too hard to copy or do something quite similar. We should certainly continue to improve it to stay ahead of any potential competition but I don't think our designer can ever be a major competitive advantage. Rohan - I like your point about the honesty and transparency and you're right, that would be hard to replicate. It certainly helps us on the business development side, but our customers don't read this blog and while we translate some of the openness you see here to our customer service, it's not out of the question for other businesses to do that part, even if the 22michaels part is harder. It definitely helps us though. If a competitor launched copying us, even if they were a large existing firm we would hopefully have a lot of great business people and people in the online retail space who would be hoping we won out which would be of assistance on the biz dev side. Matt - good points about the database of customer sizes, and Thien-Lan touches on this also and that can definitely be a source of competitive advantage for us. Manufacturing custom shoes is most certainly difficult, but for a business with shoe manufacturing experience it's doable, and potential doable for a business that doesn't have shoe manufacturing experience but has the money to hire people who do. Still, it's another small advantage for us. Thien-Lan - as above, agreed that transparency helps, but not sure it's a major one given it's more on the biz dev side rather than the customer side. The business model helps and you're right that it's a business that ideally doesn't grow crazily fast otherwise quality and service might be compromised. Still, lots of cash is able to help get around that problem. Being close to our customers, I agree that I think this is probably where our best competitive advantage lies.